I woke up this morning before work and promptly sat down at my computer to go to BHLDN.com. OMG, is all I can say. Everything I hoped for (with a price out of my budget), wedding details in all vintage flair… so so me. Thank you for opening before my wedding day! So, of course, I went looking for the green shoes that I’ve been hearing that they were going to have. And, there they were. Hello lover!!! They were perfect and sheek. Oh, I likey them!!! The perfect co-star to my wedding dress with it’s so cute little touches on it. It has the words “Something Bleu” on the top of the shoe. Then to top it off, it has a blue jewel stone on the sole of the arch. 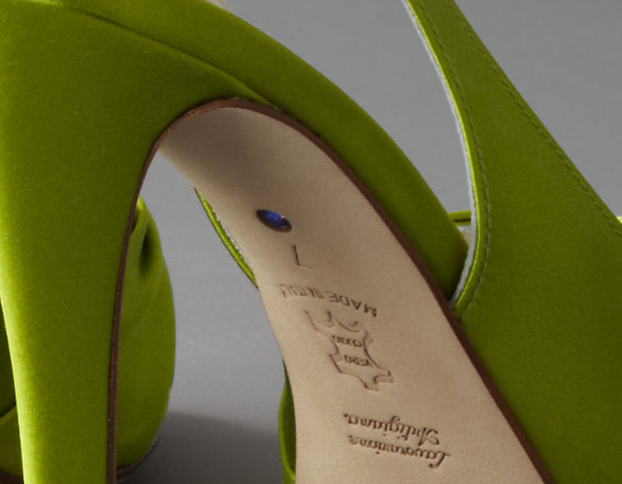 Purchased them, my perfect green wedding shoe. Wedding shoes… check! Something Blue… check!